2. OpE analysis activities have been delayed or slowed, especially in looking for trends and patterns. Particularly the study on (a) ineffective use of Vendor technical recommendations/information and (b) a study on operating experience insights on corrective actions — prioritization/timeliness of response to longstanding/repetitive issues (roof leaks, etc.). The analysis team has been trying to put the finishing touches on the vendor recommendations study. It is close to being completed. The corrective action study requires more work and includes efforts by analysis team staff. 3. Staff work on two proposed OpE Smart Samples (OpESSs) have been put on hold due to the Japan crisis. 4. Some lower priority staff work has been slowed, but not yet to the point of jeopardizing its completion. This includes one IN development task and some other work activities (i.e., support for an inspector training module development). (IOLB and IRIB) had just started working with NSIR on a TI for aircraft impact [50.54(hh)(1)]. This effort will involve the HOOs, and although we’re just getting started and are doing some preliminary work on our own, The Japan events will likely interfere with participation by NSIR folks. 1. There may be a delay in submitting the security re-integration Vote SECY. 2. 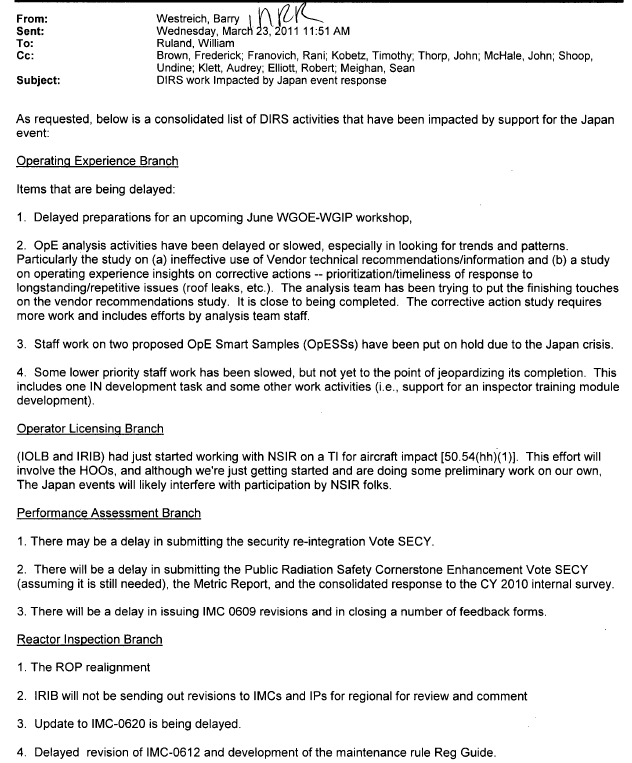 There will be a delay in submitting the Public Radiation Safety Cornerstone Enhancement Vote SECY (assuming it is still needed), the Metric Report, and the consolidated response to the CY 2010 internal survey. 3. There will be a delay in issuing IMC 0609 revisions and in closing a number of feedback forms. 3. Update to IMC-0620 is being delayed. 4. Delayed revision of IMC-0612 and development of the maintenance rule Reg Guide.